Many patients with PVR report symptoms of retinal traction (pulling), such as floaters or flashes of light. Accumulation of fluid underneath the retina results in a loss of peripheral (side) vision. When the detachment involves the center of the retina, called the macula, central vision loss will occur. Patients with chronic retinal detachment may also develop problems such as elevated pressure in the eye and inflammation. But, most often, patients will have some visual symptoms. Complex retinal detachments due to PVR are associated with retinal scar tissue or membranes; these ultimately contract, pull, and stretch the retina, causing retinal tears or stretch holes. When the detached retina contracts, so-called “star folds” often develop (Figure 1). The reason these membranes form is uncertain, but it is thought to be due to cells growing on the retinal surface. Passage of liquefied vitreous gel through a retinal tear or hole results in an accumulation of fluid under the retina (subretinal fluid) and progression of the retinal detachment. 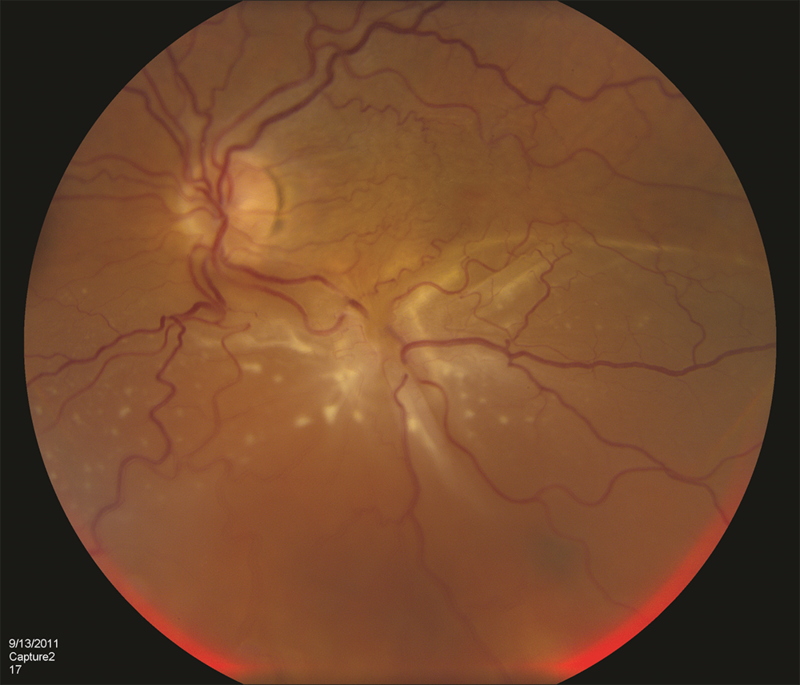 PVR most commonly occurs after a previous (primary) retinal detachment repair surgery. PVR is the most common cause of primary retinal detachment surgery failure, occurring in approximately 5% to 10% of all retinal detachments. Retinal detachment with a giant retinal tear, however, is relatively uncommon. Viewing the retina with an indirect ophthalmoscope while the doctor applies gentle pressure to the eye (scleral depression) is the primary method for diagnosing retinal detachment. 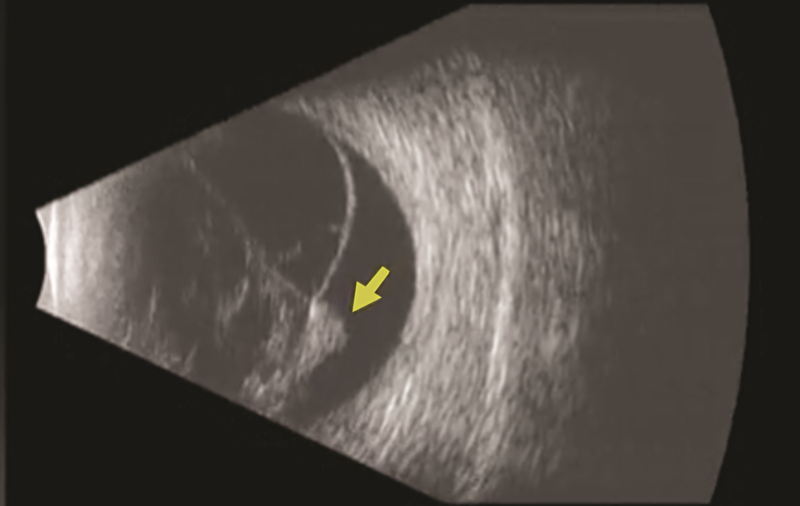 When view of the retina is obscured (blocked) by blood or dense cataract, B-scan ultrasonography can be used to determine the location and extent of a retinal detachment (Figure 2). To confirm whether there is subretinal fluid in the macula, optical coherence tomography (OCT) may be used. The only treatment option for complex retinal detachment is retinal surgery. Patients may undergo pars plana vitrectomy with peeling of membranes, a scleral buckling procedure, or both. Use of special retinal detachment repair strategies, including retinectomy or perfluorocarbon liquid, may be necessary in patients with complex retinal detachments. Laser is also used in combination with the vitrectomy to seal the retinal breaks. Your surgeon will decide which procedure is best depending on the nature of your detachment. At the end of surgery, most patients with complex retinal detachment due to PVR or a giant retinal tear will receive a long-acting gas bubble or silicone oil filling into the vitreous cavity of the eye to hold the retina in position while the eye heals. Research is being conducted to find a medical therapy to prevent and treat PVR, but to date, none has proven effective in most patients.